Microsoft Zune 30 Black (30 GB) Digital Media Player. Comes with software and charging cable. Condition is Used. Shipped with USPS Priority Mail. Refurbished, never used. Powers on as shown. Microsoft Zune 30 Black (30 GB) Digital Media Player. Condition is Used. Shipped with USPS Priority Mail. Original Zune MP3 player from Microsoft. This is the black model with blue silhouette. Hardly used, like new. 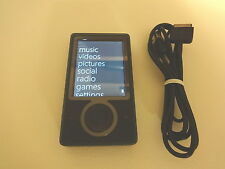 Very Good condition Black Microsoft Zune 1089 MP3 Player with Charging Cable. Tested and working 100%. Good luck! 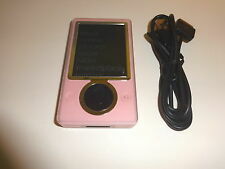 Excellent Condition ZUNE pink limited edition. Includes working ZUNE, box, manuals, cable, and case. A FEW SCRATCHES ON THE SCREEN. PLENTY OF PICTURES TO VIEW. Zune 30 in fantastic shape. Loaded with 4,271 songs of various genre. Also has 11 music videos. You will need to download the Zune app (which is free). Lot Of 30 Gb Zunes For Parts/Repair. Condition is For parts or not working. Shipped with USPS Priority Mail. You get 5 zunes of various colors. Could not test working or not because I do not have a charger anymore. I know some worked years ago, but have not used them in a long time... No functionality is to be assumed or inferred. These are being sold as parts units... You will also get an 8 gb zune. All units have surface scratches and signs of wear... But no tremendous damage... They should clean up very well. This is an as-is final sale auction. There will be no refunds there will be no returns. Seller assumes no responsibility as to the functionality of these units and is selling them as parts units only. Up for sale is a pre owned ZUNE. Color is White. I think it is the 1090 model. No earbuds or disc included. Box has quite a lot of wear. Zune has minor scuffs. There are songs and pictures still loaded on it. HARD DRIVE DRIVE.NEW BATTERY.A NICE ONe. MICROSOFT ZUNE WHITE. WE STRIVE FOR FIVE. HARD DRIVE.NEW BATTERY.A SWeeeT ZUNE. MICROSOFT ZUNE PINK. WE STRIVE FOR FIVE. Have an issue with your item?. Don’t worry, we’ll resolve it! Item Location: A2. Charging cable included. However, the player stills has the plastic cover on it and everything is in tact from the manufacturer. The Guardians of the Galaxy Vol. Minor scratches and marks on screen. We have described the item to the best of our knowledge. Request desired services on checkout and invoice will be updated with new rates/fees. Microsoft Zune Limited Edition 30GB first generation. This was a limited release with “welcome to the social” and the date of “February 11, 2007” engraved in gold on the back. Don’t be fooled by the scratched exterior of the box, this Zune is brand new, never used with the screen tape never removed or the accessories opened. The exterior box seals have been opened but that’s it. Great for any collector of rare Limited Edition items! Most likely it will need a new battery. Functionality : Item has been professionally tested and inspected. Our tests show that all features work properly. Ready for use. 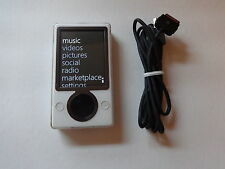 You are buying (1) Zune 30gb Music Player in Brown color. The Zune is in great condition for its age and is running the latest Zune firmware version (3.9) Just add music and use it! You will receive the following. Microsoft Zune - Model 1089. Includes OEM Zune charging cord as well as plug in brick. (see picture for the actual item). I loaded the software on a windows 10 computer and it worked fine. I have added a New USB Data/Charging Cord and Ear Buds. Hello, I bought this new and it has had very little use. The new case is factory sealed and is of good quality. Front glass has no scratches or cracks. A little buffing was done in one area on two spots. This working Zune is in gently used condition. No scratches or dents on player excellent used condition. Only wear is outside brown box, has scratches. Comes with original box instructions, cd, and cable. Model- 1089. Reset- Factory reset and ready for new user. Used - Factory Reset & Working. No other accessories are included in this sale. Unless noted or pictured power cords and/or adapters are not included. Microsoft Zune 30 Black ( 30 GB ) Digital Media Player MP3 player MP 3 player. Condition is Used. Shipped with USPS Priority Mail. NEW OPEN BOX. The headphones and power cord are still wrapped in the original tape, the screen protector is still on the ZUNE itself. The outer box is in rough shape but everything inside is good.